Yeah Gloin has cool anims, for two handed weapon. But many dwarves will use that SKL, so... Oh well.. I'll just go through the W3D's and see what fit's best. Yeah, I'm not hands-down with the BFME2+RotWK anim sets. You could try Eomer\Theoden, or maybe Faramir. Faramir has some sweet anims, but you'll have to cut the stabbing animation. 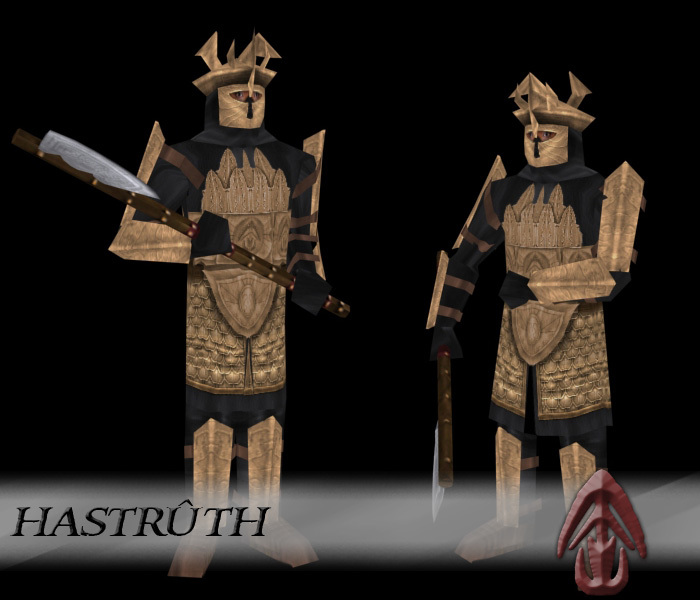 You could also use the anims I made for my Rhûn Axemen for T4A, although they might not look too good. I had to do too much from scratch, which does show in some of them, as that was never my best side of animating. I'll send you a .zip so you can check them out. Edited by Nazgûl, 09 May 2015 - 06:25 PM. I know, I'll fix that in Photoshop when the texture is exported. It's easier to paint with vivid colors in zBrush. "I don't like orange.... But orcs I hate more." He looks great, amazingly detailed! In my opinion he would have looked more awesome with his 'home grown' shirt, but he is still great. In the book (barely so in the film), Beorn showed up at the last moment to save the day. How does this translate to BFME gameplay? A spellbook summon! If not final tier, he could be a replacement for the Tom Bombadil summon. I fully agree Mathijs. He should not be a fortress hero, but a summon, 3rd or 4th tier. You know how Bombadil has a powerful ability that can only be activated once or twice during his summon duration? That's how Bear Form would work. It's the cleanest implementation that would make the most use of the art. As for skeletons, I think Gimli would be the best fit. Faramir's too centered around a sword, Aragorn is too royal. Gimli is small, yes, but I don't think it'd look bad. I once rigged Beornings to his skeleton and they looked fine. Two-handed axes are held and swung very differently to swords, so I would rather the model felt a little bit squished than move in an obviously faulty way. A more difficult approach would be to try and transplant Gimli's attacks to the Faramir skeleton. Good thoughts =) Bear form will be limited for sure, and Gimli sounds like a cool set of anims, if not wildman will work. The model is fantastic, but I don't like the texture on this one. It looks quite bland and generic to me. Perhaps I'm alone on such thought though. Youre not alone. the texture doesnt pop. Edited by Nazgûl, 13 May 2015 - 12:58 AM.